This may see a little premature, but I am already starting to think about what kind of reading material I am going to take on my August vacation. Usually this means I have two weeks of reading opportunities that I need to try and fill. If we are headed somewhere via car, often up to Maine, it means that I take about 10 books for 14 days and buy 20 more along the way. 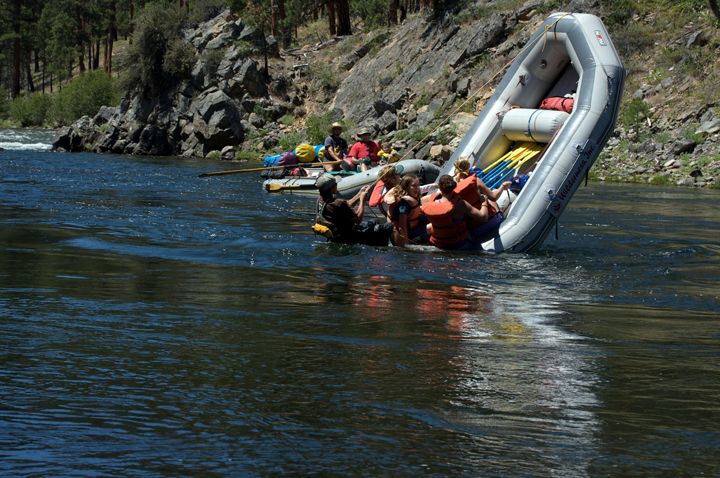 But this year we are headed to Idaho to go on a whitewater rafting trip. Not only is this kind of trip probably not very conducive to reading, but we have severe luggage limitations. For six days on the river we are limited to a fairly small “wet bag” and most of that needs to be filled with things like thermal clothing and rain gear. But they do suggest having a book to read. So what should it be? It needs to be long enough to last. It needs to be lightweight. It needs to be a copy I don’t mind ruining. My first thought was to take something long that I know I want to read but have a hard time committing to when I have dozens of other books at hand. But I could find myself getting easily distracted and then not doing any reading. Would that be a bad thing? With a group of 16 people in remote wilderness with no phones or anything else electronic, surrounded by amazing views and scenery. Constantly looking over my shoulder for bears and mountain lions. Maybe I shouldn’t have my head in a book. My second thought was Trollope or Wilkie Collins. I kind of wish I hadn’t already read The Three Musketeers. That seems like a perfect book for this sort of thing. What do you all think? What should I take? What would you take? I should add that the rest of trip will offer plenty of reading time. Flight to Denver. One night at an airport hotel. One night in Stanley, Idaho. Six nights on the river. Four nights in Portland, Oregon and then a flight from Portland back to DC. That is going to require reading material as well. Maybe if it is a big chunkster, it could last the whole trip. And god knows that books will be purchased at Powell’s in Portland. This isn’t the outfitter we are going with, but this video gets me really excited and makes me think I might not need a book after all. Dickens? He tells a rattling good yarn and is very readable! I think Trollope or Wilkie Collins would be great — a big fat one. Definitely a copy that you won’t worry about damaging. Maybe The Count of Monte Cristo if you want more Dumas? Or Les Miserables? If you decide on Dickens, I strongly recommend Bleak House — very long and a ripping good yarn. I was going to say Bleak House too very readable (and I am not the hugest of Dickens fans). A Fine Balance is pretty long and a damn fine novel if you’ve not read it as is The Crimson Petal and the White. Will love hearing what you pick. I’d say go with Trollope or Tolstoy, or maybe a good volume of letters or diaries would work well. I’m sure that I left a copy of The Goldfinch in paperback at yours when I stayed. So I suggest that. I was going to suggest the Count of Monte Cristo as well, if it’s not too big a book. And I’ll be interested to see the results of a trip to Powell’s – and envious too! My first thought was The Count of Mont Cristo, too, but Trollope or Collins would also be perfect. Sounds like an exciting trip! How about Angle of Repose by Wallace Stegner? Might fit right into the landscape. All that to say, I empathize with your pain and wish you success. I am reading A Little Life right now. The book that everyone says is devastating. I must say, I am only 5% in and completely drawn in already. Definitely Trollope, or some other similar Victorian brick of a thing. As a long time Collins fan it also sounds like a good opportunity for the likes of Armadale, it will be the perfect opportunity to get into some lengthy classic you’ve half meant to read for years. I’m no help either – the mere thought of just one book sends me into a panic! If it were me I’d probably take Middlemarch, but I wouldn’t do anything involving any kind of travel on water. Do let us know what you choose. Never too early to contemplate vacation reads! I should start thinking of that myself, for my trip to Maine in June. A couple of years ago, on a trip overseas that would be mostly sightseeing, I applied similar criteria as yours for the one travel book I could take. I ended up choosing a used mass market paperback of Lonesome Dove and it was a good choice. I have no idea if that book would be up your alley or if you’ve read it before, but the storytelling is superb. I can’t wait to see photos of you trying to read while on a raft in the midst of a roaring river! Wilkie Collins A Woman in White might be a good choice. ( I read it this past winter while sick and it kept my attentions). In the minority, but hated Bleak House while in college, but it may be time to give it another try. The Goldfinch is a page turner and would hold your attention even though you don’t love modern. It was a very satisfactory read and I enjoyed it very much. For your wash bucket adventure how about more swashbuckling adventures from Dumas featuring D’Artangnon and his friends – the sequels Twenty Years After and the Vicomte de Bragelonne are great reads with lots of intrigue and filled with historical detail and the trials and tribulations of great personages of the age. They are one of my all-time favourite trilogies, along with the Tales of the Otori by Lian Hearn – the same swashbuckling heroism and also 17C – but this time in Japan with Ninja and Shinto and Samurai. If I admit to just finding your new blog, then you’ll know how remiss I’ve been about book blogs lately, but it’s true. Welcome to WordPress. Have you tried migrating your old posts over to this new site? It didn’t work for me at all but It may work for you. As for Idaho reading….. I like to read a book about the place I’m visiting during a visit. I don’t know of any Idaho books but googling “Novels set in Montana” produce a couple of pretty good lists, close enough. A River Runs Through It is fantastic. I say, take a short one and then see if people will trade. See, I think you should pick something that needs to be read really slowly and savoured. Then you need only read a little bit at a time. Something like Pilgrim at Tinker’s Creek by Annie Dillard. I’d take a book to devour and abandon on the plane there, and buy something new for the journey home. You are brave going white water rafting – I wouldn’t last five minutes!